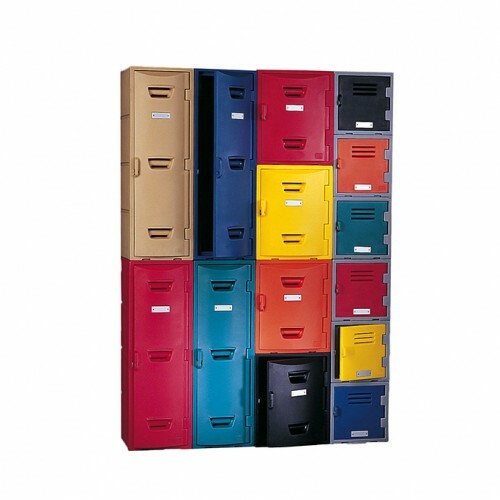 Standard Lockers - Plastic Lockers | Remcon Plastics, Inc.
Our most economical alternative to metal lockers single. Remcon has partnerships with several stocking distributors. They keep a supply of gray lockers on hand at all times. – Global Industrial – See lockers. – C&H Distributors – See lockers. – Bunzl Processor Division – See lockers. Easy to clean, durable polyethylene lockers built to withstand the harshest environments and provide valuable benefits over steel. Hasp locking mechanism accepts any standard 3/8 inch lock. Standard 15 inch depth on 12, 18, and 36 inch units; 18 inch depth on 60 inch units. Build 6-tier with 12”, 4-tier with 18”, 2-tier with 36” and 1-tier with 60”. 12″ locker doors only available in gray or clear. Rugged rotomolded construction resists cracking, denting, and offers greater durability than inferior injection-molded counterparts. Unlike metal lockers the doors close quietly without loud banging. Polyethylene will not rust like steel making them perfect for hot, humid, or particulate-free environments. Easy to clean by simply hosing down with soap and water. Made with FDA compliant 100% virgin polyethylene and pigments for safe use in regulated industries. Stackable units can be mixed and matched to create your own configurations. Locker bank can be capped with a sloped unit to discourage storage on top of the bank. All doors are double-walled for additional protection and vented to provide fresh air flow. Units come standard with drain holes and aluminum engravable identification plate. Mounting kit allows for hanging on a wall or mounting back to back and includes detailed instructions for hassle-free installation. Eliminate rust contamination and create a safer work environment by replacing old steel lockers with Remcon polyethylene lockers. What signals do rusty lockers send? Why subject employees to this hazard, affect or contaminate your process or product, and leave partners and guests with a bad impression? There is a better option. Remcon polyethylene lockers will not rust like steel which makes them perfect for hot, humid, or particulate-free environments. They are easy to clean by simply hosing down with soap and water. Rugged rotomolded construction resists cracking and denting. They last long and they always look great. If you are ready to make a change from old, rusty metal lockers and create a safer, cleaner, better work environment, Remcon lockers are the way to go.